What they did not say was that physical wheat in the North East is £15/t more expensive than in the South East, and if they use 1.1Mln T wheat a year, that adds up to an additional £15m more than if they had built their plant in the South. 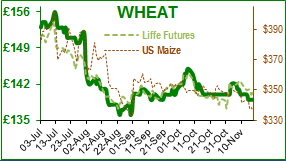 No doubt there were also difficulties in hedging wheat purchases against Liffe futures. Today, UK May wheat futures touched £143.00/T the lowest value since mid-August. UK wheat at €161/t is closely following the movement of French wheat valued at €167/T. UK wheat exports for September were 75,000T of which Spain and Ireland were the largest shipments of about 28,000t each. Year-to-date exports are 147,000T (676,000T last year), which indicates that we will not export all our wheat like we did last year. Overall, UK wheat supply is thought to be in balance with demand, but the Vivergo news could ease overall supplies, and prices. This week Egypt bought 240,000 T of Russian wheat at a surprising $194.65/T, $1.85/T cheaper than last week ($192.50 last year) despite moving the goal-posts on their ergot criteria; exporters are very wary of rejection for ergot/poppy seeds etc. The Russians are still dominating the market to the point where the word ‘monopoly’ is being whispered. The old adage that ‘big crops get bigger’ seems apt for the Russian wheat harvest. It may also be true for EU ending stocks, if EU exporters are continue to be stymied at every tender, which may eventually set the price direction for new crop. In comparison to EU prices, China sold 60,000t wheat from its 2012 vintage reserves for an average price of $358.74/T. No wonder the US has filed a complaint against the way in which China protects its farmers and encourages domestic production. Argentina has promised to reduce the cost of docking services at Rosario port by 30% in December, as ex-businessman and now President Macri's attempt to improve the export trade and the economy. 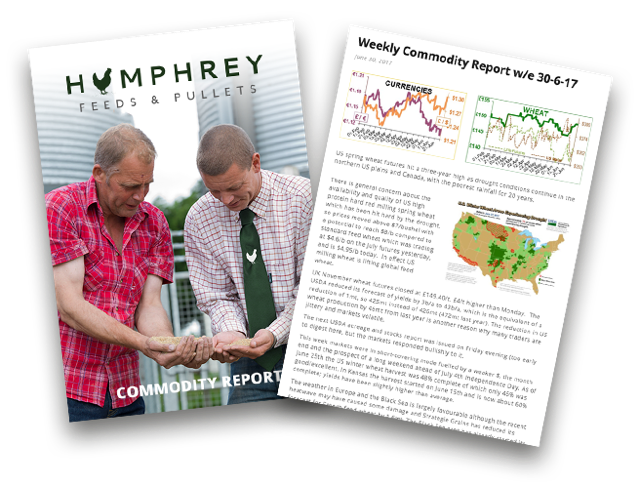 The global trade is closely watching the progress of South American maize and soya. The Buenos Aires Grains Exchange estimate Argentinean soya planting is 24% complete overall (same as last year, 5-year average 32%) but progress is patchy with wet conditions in BA and La Pampa and dry in Cordoba. In Brazil rains in the Goias and eastern Mato Grosso came just in time for farmers to plant soya, and estimate that as a country the crop is 60% planted (92% in central Mato Grosso, about 30% in Rio Grande do Sul). Both the National Oceanic and Atmospheric Administration (NOAA) and Australian Bureau of Meteorology (ABOM) believe that La Niña is up to 75% probable. In the summer of 1889, Van Gogh voluntarily joined an asylum in Provence where he painted the ‘Olive Orchard’. The painting is now in a Missouri museum, and whilst being catalogued and inspected with a low-powered microscope, the remains of a small grasshopper were discovered imbedded in the paint. He was known to like painting outside and wrote a letter to his brother ‘I must have picked up a good hundred flies and more off the four canvases that you'll be getting, not to mention dust and sand’. Van Gogh was unsuccessful in his own lifetime; today this painting would probably sell for over £100m (including the grasshopper).